For the first couple of days at Fox Chapel Marina, we hibernated on the boat. We were just happy to have plenty of power to run the air conditioners. Shortly after we arrived we met Rich, a member of MTOA-a boating club- who had been anticipating our arrival. He offered to help us out in any way possible and did help Joe with some of his boat chores. Once I finally ventured out for a walk, I found that we were very near a huge shopping center and even found a place to get a haircut on a Sunday. On Monday, Carolyn Ann was briefly pulled from the water to check for any damage that might have occurred on the way up. Off an on there had been large pieces of debris in the water and several times it sounded like the props had taken a pretty good hit. Once Joe had a chance to see underneath, though, he found that no damage had been done. That was the good news. The bad news was that the bow thruster didn't work on the way back to our slip. Hmmm. After many phones calls and much consternation, the decision was made to replace the batteries that power the bow thruster and anchor windlass, as well as the charger for the batteries. Then there was the matter of this small puddle in the engine room. Eventually, Joe found that there was a small crack in a pipe near the pump that brings potable water to our faucets. Just another little chore to keep him busy. But we weren't in Pittsburgh to work on boat problems. First on the agenda was a trip to Frank Lloyd Wright's Fallingwater about 90 minutes from Pittsburgh. Joe's brother, Rick, and his wife, Carol, had expressed interest in meeting us there so we got a rental car and took off. We had signed up for the in-depth tour of Fallingwater and all really enjoyed it. There were so many interesting aspects to the house that I could go on and on. But mostly I would just advise anyone to go there. Pictures don't do it justice and you couldn't possible photograph everything. Paula, our docent, did a great job of pointing out and explaining many of the details. Probably the most incredible part is that it was built in the 1930's; constructed mostly by local farmers and others who were out of work, rather than expert masons, etc. Another tidbit was that Wright apparently did not begin to draw a plan until the whole thing was formed in his mind. Considering the details included in the house - built in shelves and furniture,that had to be accommodated while the walls were going up - that's just amazing. After our tour we drove to Seven Springs for dinner and to spend the night. Years ago (36 maybe? ), Joe's parents had rented a place there and all the family had gone up to ski. Its gotten bigger since then, but we had a good dinner and enjoyed catching up on all the family news with Rick and Carol. The following morning we toured Kentuck Knob, another Frank Lloyd Wright house in the area. This one was built in the 1950's in what he called his Usonian style. These were smaller, more affordable homes. The story is that Wright was invited to a party there soon after the house was finished. He had not been on sight during construction but informed the owners that he didn't need to see the house - he had designed it. An indication of how vividly his designs must have been in his mind. Again we were struck by many of the details built into the house, but maybe the thing that stuck with me most was in the kitchen and not a part of Wright's design. It's a Frigidaire cook top in a Murphy bed design. In the photo, one of the four burners is flopped down for use while the other three are up out of the way. The kitchen is very small so the additional counter space is great. We were told that you could even unplug the burner and plug it in somewhere else, like on a buffet table. These were only marketed for a few years in the 1950's but I can't understand why. Think of induction burners done this way, maybe. 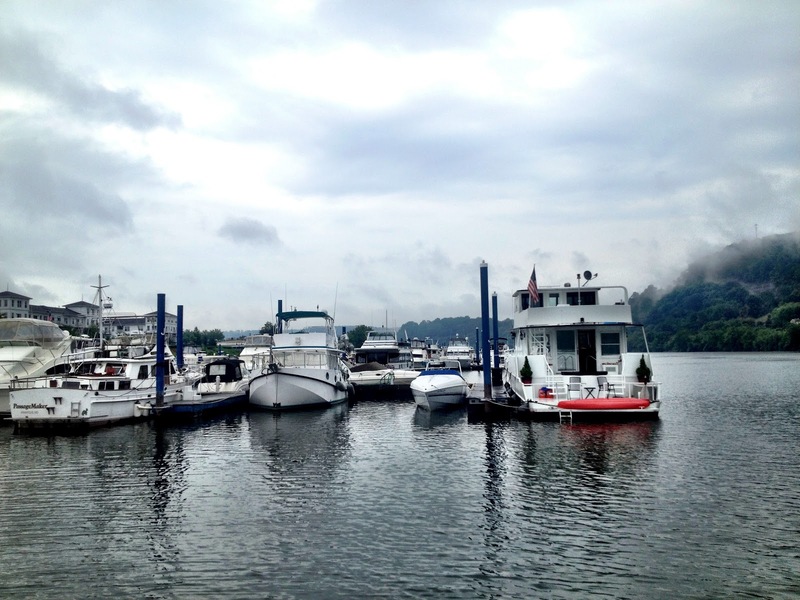 When we got back to Fox Chapel, Barb and Randy (Lazy Dolphin) had arrived in Aspinwall Marina and on Sunday morning moved to Fox Chapel. Later that afternoon we all set out for a bit of sightseeing. We didn't have a real plan, but drove downtown and saw some of the amazing buildings there. The whole PPG complex was stunning - short glass buildings reflecting in tall glass buildings and dancing fountains in between. Joe's brother Rick had mentioned the Cathedral of Learning at U of Pitt, so we also went by there. It's quite a structure - one of the tallest on any college campus. The interior of the first floor seems more like a church, but is used by students for studying. There's even a big fireplace that is lit during the winter. Since we were there on a Sunday, the rooms were locked up, but there are twenty some classrooms decorated by groups of different nationalities in styles from the 5th to 18th centuries. 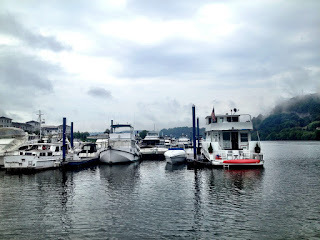 We also checked out the marina on the Monongahela that we'd planned to go to earlier and drove to the top of Mt. Washington. What a view! By that time we were all starting to get hungry, well, I was anyway. Prompted by friends (Henry) and my 1000 Places to See Before You Die book, we decided to stop by Primanti Bros.' original Strip District location. They mostly serve "almost famous"sandwiches, and have since the 1930's. You can get pretty much any meat you want, but all the sandwiches are topped with cole slaw, tomatoes and french fries. Yes, the fries are on the sandwich. 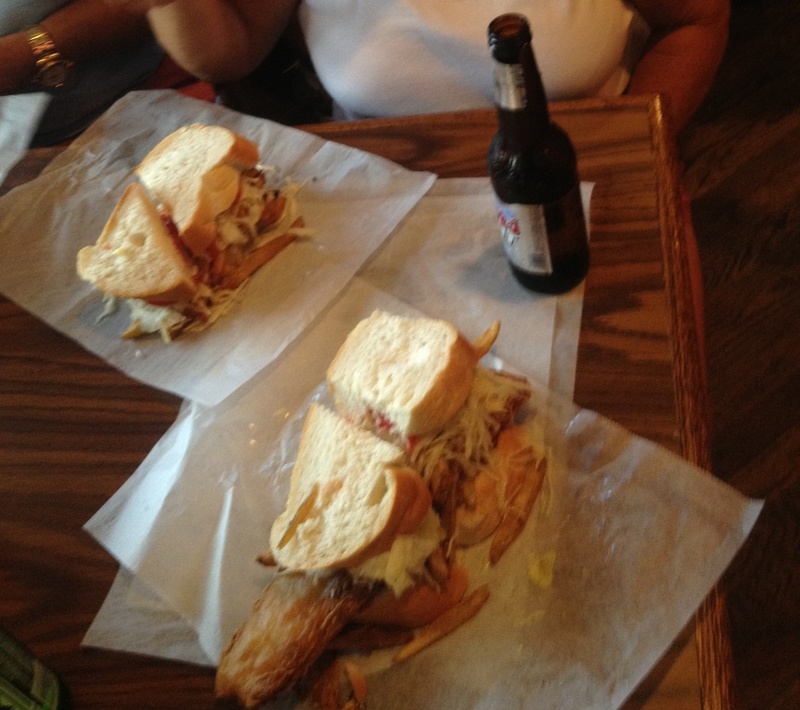 Joe and Randy went for the Colossal fish sandwich which turned out to be no exaggeration! The next day Randy and Barb left for a road trip back to Virginia. Trying to see the real roots of Pittsburgh, Joe and I toured the Carrie Furnaces. Out of service since the early 1980's, two of the former seven furnaces are still standing. Our docent, Gary, had started working there shortly after graduating from high school in 1970, following in his father and grandfather's footsteps. We all signed waivers and Gary took us through the steps from the arrival of iron ore, limestone and coke to the final product of molten iron, which was then sent via the Hot Metal Bridge across the Monongahela to be made into steel. The process was actually quite interesting and Gary's knowledge of it was extensive with the added bonus of stories from his father and grandfather's times there. Later that day, we went to Clayton, Henry Clay Frick's Pittsburgh home. Of all the guilded age millionaire's mansions that existed here, Clayton is the only one that survives intact. It was donated by Frick's unmarried daughter at her death and so had never gone into disrepair as many do. All of the furnishing remained also. The woodwork inside was beautiful - and also un-photographical. By the end of our tour, the skies had opened up with thunder, lightning and a terrific downpour - so we also don't have any exterior photos! Since we'd covered steel, Joe went on a search and found a coal mine we could tour. Tour Ed coal mine was a working mine and has been converted into an educational facility. Before we donned our hard hats for the tour, we were given a short lecture on the history of the methods and tools used by coal miners through the years. Once in the mine, there were displays of the different machinery used from the 1800's through the mid-1900's. Again our guide, a mining engineer, had first hand knowledge through his career as a federal mine inspector. Having finally received all the necessary equipment and instructions, Joe spent the next few days finalizing the repairs on the boat. Randy and Barb had returned from a trip to VA and we had a visit, by car, from Carl and Lois (Puffin) who spend their summers in Ohio. (You may remember we stopped to visit them last summer on our trip across Lake Erie.) All the rental cars returned and chores completed, it was time to move on. Our plan was to go up the Monongahela River (The Mon) to Morgantown, WV, until Joe found out that one of the locks on the way was closed until August 3. We were planning to travel with Randy and Barb, so after a meeting we decided to stay at Fox Chapel through the weekend. Enterprise has a good weekend rate, so we split a rental car and decided to do some more sightseeing together. The Mattress Factory - a gallery of installation art - was listed in my book, so we decided to give it a shot. It was definitely not our favorite stop, but there were a few that we liked and also a few that we just had to shake our heads. Maybe we're just not cultured enough to get it. The next day was spent in the Heinz History Center - five floors of exhibits. We didn't even get through half of them, but what we saw was really well done and very interesting. 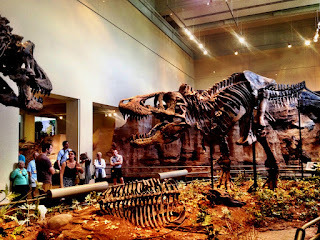 Still in museum mode, the day after that we went to the Carnegie Art and Natural History Museums. We managed to hit a tour with another really good docent. The Carnegie is famous for its collection of dinosaur bones. There were no children in our group so the guide started off by telling us everything we'd learned in school about dinosaurs has now turned out to be wrong. She proceeded to give us an incredible amount of information - all illustrated by their extensive displays. Of course you can really build up an appetite reading all those little signs in the museums, so we went to the nearby Union Grill. Nice place, nice food - and a really big fish sandwich. Kinda put the Primanti Bros. to shame. Of course, this one didn't have any fries in it - not a bad thing. Again, it was time to return the rental car and we finally left Fox Chapel. We followed Lazy Dolphin down the Allegheny, made the left to start up the Monongahela. A short way up the river is Station Square - restaurants, bars, shops, dancing fountain and a marina. It was a short trip so we had time to ride up the incline railway - actually, we rode up and down both the Monongahela and the Duquesne Inclines. The view from Mt. Washington at the top is spectacular. You can even see Carolyn Ann down there at the marina. The incline railways were built in the 1870's as Pittsburgh expanded and workers had to commute from the surrounding hills. They still operate with the same equipment and still carry commuters in addition to tourists. Station Square is located close to Pittsburgh's light rail - the T. On it, we could go downtown and across the Allegheny to the North Side. We took the T to the Andy Warhol Museum. Joe had not been excited about this one, but had decided to go along. Included with our admission was a 30 minute "gallery talk." The subject of the talk is different each day of the week. The day we were there, the it was given by one of Warhol's nephews. The half hour talk turned into more than an hour of stories about visiting "Uncle Andy," the family history and the man behind the art. It gave us a new slant on the man and the art. When we left the museum, we realized that we were only about a mile and a half from the boat, so we walked through downtown instead of taking the T back. Pittsburgh is filled with great old buildings as well as striking new ones. Among them are small parks with interesting sculptures. The next day we took the T back to the Heinz for more history and again walked back to the boat. As we were crossing the bridge by the boat, Joe stopped to take a picture. I noticed a woman stop and look at us, then she said "Punk?" It was Kris who we'd met in Wheeling when visiting her mother-in-law, Sue. As it turned out, Sue and her husband Paul were again in Wheeling. After a false start or two, we managed to all get together for dinner and had such a good time. After dinner we took one last ride up the incline to see the lights of Pittsburgh. We've loved our time in Pittsburgh - it's beautiful, a great mix of old and new and too much to do! Family note: daughter Caitlin is moving to Redmond, WA!